Volunteers Centre Skopje is continuing with the good practice and cooperation in the field of Vocational Education and Training (VET) program of Erasmus+ with the Spanish association Mundus. After the first group in 2018 (3 months of stay), we hosted the second between 19th June till 20th July. Alba, Damaris, Laura and Mireia were the 4 girls from Barcelona that accepted the challenge to spend one month of practice in International environment, in Macedonian companies and broaden their experience in their professional dedication. While Mireia`s profession brought her in a Beauty salon for medical and aesthetic services, Alba, Damaris and Laura were into a nursing residence for elderly and dependent people to exchange practices and develop new skills. Alba: In the beginning of my experience at the residence I felt a little bit disoriented. But day by day I was feeling more comfortable and wanting to go and help them out even more, as I shared so much lovely moments with these people. I felt as I wanted to treat them as I would my own grandparents. At the end of this journey I ended up crying and hugging everybody. Damaris: This experience for me was full of ups and downs and if I have to think again I will not hesitate. I cannot guarantee that every path is covered with roses but I learnt and improved myself as a person thanks to it. Mireia: I will never forget my practice here in the best aesthetic studio, not only for the quality of their services but also in the treatment of the clients and their employees. Laura: This unique experience I define as a roller coaster with many turns but worth of experimenting. It makes you develop your best life skills by overcoming all the obstacles that you would maybe never have. You become an autonomous person generating an impulse to help and be thankful, treat the others as you want them to treat you. For most of the girls this was their first out-of-the-country experience, living and establishing daily routine in international environment, challenging intercultural difference and customs. But surely they made the best out of it and we are proud we had the opportunity to host them, upholding the principles of the Erasmus+ program and learning valuable life hacks to their promotion into mature persons. Damaris: Yes, an experience like this makes you totally independent, mature as a person, since you have to do things that you never usually do because you have your parents to do it. Keeping your living space clean, washing clothes, managing your finances, shopping and preparing your own meals were some of the everyday schedule you have to perform and make the best of it. Alba: Well here I am, few days left before going back to home and I will never regret this journey, it was worth it in the all aspects: the experience made me grow up as a person and helped me to understand and value all that I have, whether physical or spiritual. Laura: Thank you for giving me time and space to talk about this unique experience, worth experimenting. It trains you to develop your best skills for life. There is nothing impossible in this life. After this you are a different person for better, with new virtues and skills. Mireia: If someone from Erasmus reads this…I encourage you to take a step and do it…It`s wonderful! Our VET interns also had the opportunity for cultural visits, exploring the city and nearby sights, interacting with the locals during their stay, comparing different customs, food, life style and working habits. And being away from home, out of your comfort zone makes you compare, what you like and dislike, whether you can absorb it, bring back home a piece of it and share it or simply discard and forget it. And in cases like this people are always more enthusiastic and beauty oriented, to see and explore the best of their time spent. 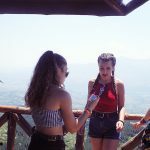 Mireia: Macedonia is super different from what any of the photographs can show you online. Nothing compares with the beauty that your naked eye can show you. And there`s nothing I would have imagined compared to what I`m seeing these weeks. Damaris: There are moments when you desire to absorb the world at once and visit all the corners of the place you are in, the different ways of living. The fact is that I recommend that you come to Macedonia. There are so many nice places to see like Ohrid Lake, Canyon Matka, Vodno and Skopje sights. I guarantee you will not regret. Laura: Try to learn a word in Macedonian. It is difficult but very cool language. After all we are all human born with the gift of communicating between us. And the tourism is very interesting. 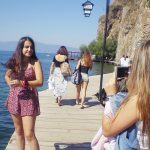 Maybe there are places of different points of interest but I`ve never seen beauty like the Ohrid Lake and the Matka Canyon, you have to visit these. Alba: We stayed in an apartment just 5 minutes from the downtown, in a neighborhood where the party starts. We have visited many places in Skopje, some that I like more than others but definitely you have to visit the Canyon Matka, magnificent place. And there`s also the Old Bazar, a part that is a must to see and visit. 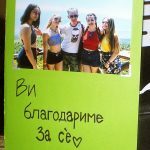 And after a month spent in Macedonia we had to say Goodbye to these lovely girls that captured the hearts of many wherever they went, hoping that will carry with them back home nice memories and most of all the experience and the new skills developed. After all, we are all part of the big Erasmus family, wherever we live, wherever we go.